A Christmas win on Monday Night Football would be the perfect present for Eagles fans. Nick Foles was stellar in his first start of the season for the Birds (12-2) against the Giants, tossing four touchdowns and no interceptions. He'll hope to emulate his incredible, seven-touchdown performance in 2013, the first time he faced Oakland (see story). The Raiders (6-8) have had a disappointing season. They lost a heartbreaker last Sunday night to the Cowboys, which all but eliminated them from playoff contention. The Eagles, however, can clinch the No. 1 seed in the NFC with a win. It should be a raucous atmosphere at the Linc Monday night (8:30 p.m./ESPN). 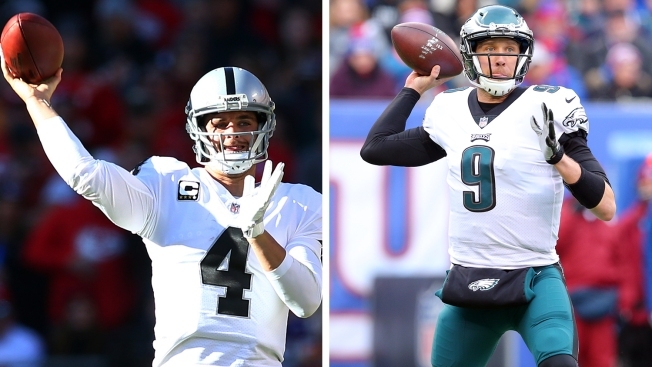 The Eagles are 12-2 at home under Doug Pederson, Nick Foles has won his last eight regular-season starts at the Linc, the Raiders are 6-8 and playing out the string in a disappointing season and the Christmas evening crowd is going to be ready to keep the celebration going well into the night. The Eagles aren't losing this game. They could start Nate Sudfeld and win this thing. The defense, after three weeks on the road, gets its act together and plays well, Foles puts together another efficient performance, the Eagles get the running attack back on track and clinch No. 1 seed for the first time since 2004 with a win over the Raiders. One thing I would love to see after the Eagles build up a big lead is Brent Celek getting the 28 yards he needs for 5,000 in his career. That would be a Christmas present every Eagles fan would enjoy! There was a time when this Christmas Day matchup between the Eagles and Raiders was supposed to be a must-watch. The Eagles have been much better than expected and the Raiders have been much worse. It's set up a matchup between the 12-2 Eagles and the 6-8 Raiders at the Linc. At the Linc this season, the Eagles are a perfect 6-0, while the Raiders are just 2-4 on the road. As long as the Birds' defense bounces back a little and Nick Foles continues to look good, there's no reason the Eagles shouldn't win this one easily. Nick Foles passed his first test, and everyone is breathing easier and feeling satisfied that Foles can keep the offensive efficiency going. As for the Birds' defense, for a third straight game, they were on shaky ground. Defensive coordinator Jim Schwartz told the media he's getting tired of repeating himself about how his defense needs to "get back to playing clean football and stop giving offenses help." Enter the Oakland Raiders, whose season turned out to be drastically different from the previous season. Quarterback Derek Carr and his offense can't find consistency and the defense can't make the necessary stops. Big play wide receiver Amari Cooper has been hampered by an ankle injury for several weeks and may have to sit this one out. The Raiders do have a pair of dangerous pass rushers in Pro bowler Khalil Mack (10.5 sacks) and Bruce Irvin (7.5 sacks). Right tackle Lane Johnson, selected to his first Pro Bowl, has been outstanding against premier edge rushers this season, but the other side of the line has been up and down. Left tackle Halapoulivaati Vaitai has struggled the past two games and may need some help protecting Foles' blind side. This game might be the final time we see many of the Birds starters until the playoffs, so they'll want to put on a good show. The Raiders are still alive (barely) in the AFC playoff race, but they are coming off two dispiriting losses to Kansas City and Dallas. It is hard to imagine them being too excited about traveling all the way across the country to play the Eagles on Christmas night. They probably just want to get this disappointing season over with. Still, the Eagles can't afford to take this one for granted. They were lucky to squeeze past a two-win Giants team Sunday and while Nick Foles did a good job filling in for Carson Wentz, the defense was downright pitiful. I'm sure it has been an uncomfortable week in the defensive meeting room watching the tape of that performance with Jim Schwartz providing commentary. That combined with the emotional lift of playing their first home game in almost a month and the incentive of wrapping up the top seed in the NFC should be enough to carry the day - or, in this case, the night. There's a very real chance Oakland will be eliminated from playoff contention before kickoff, so you have to wonder what kind of energy the Raiders will bring to the Linc. It's a cross-country trip, on Christmas, and Pro Bowl left tackle Donald Penn - one of 14 Raiders listed on the injury report this week - just landed on injured reserve. The Eagles' defense and, in particular, the secondary looks vulnerable, though the Raiders may not possess the mindset let alone healthy personnel to take advantage right now. I expected a blowout last week, too, against the Giants, and we all saw how that went, but that was an NFC East rivalry, on the road, and a team that had nowhere to go except up. The Eagles may just catch the Raiders at their lowest point. Oakland's pass rush will affect the Eagles early in this game, I think, but once the Eagles get their protections down, Nick Foles should be able to pick apart a shaky secondary. Offensively, the Raiders are reliant to a fault on jump-balls to Michael Crabtree. So as long as the Eagles can shut him down near the goal-line, this should be a multi-score win.